In the spirit of the love for our country and also our obsession with fabric, we thought it would be great to explain why we celebrate the most important piece of fabric flying in our nation. The American Flag. A Waubeka, Wisconsin school teacher named Bernard John Cigrand is one of the people credited with championing the celebration of the American flag. In 1885, he placed a 10-inch 38-star flag in an inkwell and had his students write essays on what the flag meant to them. He called June 14th the flag’s birthday and Stony Hill School is now a historical site. From that day forward Mr. Cigrand dedicated himself to inspire not only his students but also all Americans in the real meaning and majesty of our flag. In 1916, President Woodrow Wilson issued a proclamation that officially established June 14 as Flag Day. In August 1946, National Flag Day was established by an Act of Congress. So today, when you see the great American flag flying, be proud of the flag and what it truly represents. 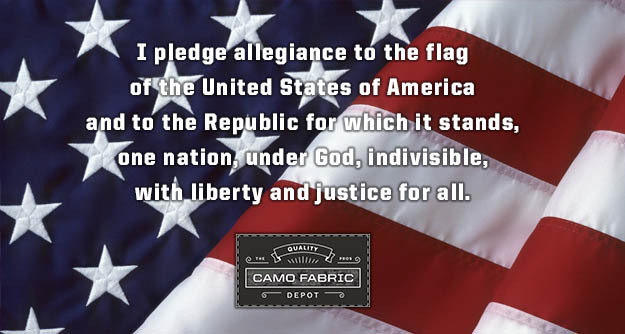 Be proud to be American and salute this wonderful piece of fabric. Learn more about the flag, its history, protocol, and ways to pay your respects, including the proper way to fold it.